Hmmmmm. The forecast is dire. Do I really want to spend two nights in the pouring rain and the howling wind in a tent on the coast of North Wales? Of course not. I'd much prefer it if it was warm and dry like it was a couple of week ago. But then my friends will be there. I have been looking forward to this for a while. I'll just be bored sitting around at home in the pouring rain and howling wind anyhow. I have toothache too. The emergency dentist prescribed antibiotics and mouthwash about 3 weeks ago which has made stuff all difference. I have registered with a dentist locally now but he or she can't see me until I've had my initial inspection. This is still another week away. I have pain meds and coping methods, I guess I may as well be miserable in a tent as miserable at home. Meh, it's a challenge I guess. The ride down with 6 other bikers is, frankly, fabulous. The rain doesn't. The wind is here, noticeable but not at all dangerous. The only minor frustration is the road has patches of damp and the odd deep puddle. Otherwise Andy and I head off ahead of the rest and get a little giddy in places as the greens and browns of the welsh countryside become a blur. Brew break. Not the best of weather but it's not raining. At Shell Island we try and find an ideal spot. Ideal would be high up to avoid any potential flooding but low down to shelter from the wind. Catch 22. We camp on the side of one of the various hillocks that has a bluff above, hopefully sufficient to take the worst off the wind. Tents up so it must be brew time. There follows a joyous evening of banter at the bar then later in Bernard's very large tee-pee tent. The booze is flowing and by 1100 the rain is rattling the canvas and the wind is picking up. As the drinkers retire my teetotal self settles in to my sleeping bag. The wind pushes the nylon flysheet hard, the rain is loud and heavy, my toothache is having an episode yet despite all this I'm OK.
Once inside the sleeping bag and finally comfortable my bladder decides now is the time to empty. I shuffle out, do my thing, swill some more salt water to ease my pain, get back in, get comfy, need a wee and then repeat until 0200. By 0230 my bladder is empty, my tooth has calmed itself and the wind is battering the tent. I fall asleep. 0500 sees me awake just for a shuffle. No pee required, no tooth pain. I can hear the tent creaking oddly but everything looks OK, probably one of the guy strings rubbing the poles. Hell's bells though it is blowing a proper hoolie out there now. I nod off a while longer. 0530 and something is not right. The tent sounds different. I can't see the flysheet through the inner tent's material as such but it looks wrong too. I open the inner to be confronted by the collapsed porch. Damn. I like adulthood and maturity though. 20 years ago this would have been a national disaster. 10 years ago this would have been a personal catastrophe. Don't get me wrong at 47 it is frustrating, annoying, bothersome and a problem but I am alive and unharmed and I have options. One section of pole has splintered along its entire length. It cannot be taped up or splinted, it is defunct, deceased, it is no more a tent pole. I could move the bike close by and rig some form of support from the bike to the tent? My worry is the wind is so strong the pressure on both the tent and the bike could pull the bike over onto the tent. Rather than one issue I could soon have several more serious issues. The forecast is for the wind to continue all day which would preclude any riding if the bike is part of the tent. I could ride to the nearest town, where would that be? Porthmadog? I can't be sure there's a camping shop there. It'd probably be Bangor where I'd be sure to find a replacement pole. That's 40 miles away. 80 mile round trip at least. Then I've got to find a camp shop that has a pole. Could be a wild goose chase. All this time I'm sat in the porch holding up what is left of the pole against the gale. I could just ride to Bangor and buy a cheap Argos tent? Again 80 mile round trip. Do I have space for ANOTHER tent on my way home? I already have 3 tents do I need another? Will a cheap Argos tent survive this wind? 80 miles too. I can be home in about 130 miles. Hmmmm. I could bunk with Bernard in his massive tee-pee thing? Tell ya what Ren, it is not actually raining at this moment in time. Let's get the tent down and everything packed before the forecasted deluge arrives. That way I can either bunk down with Bernard, head out to find a new tent or pole, or just quit while I'm ahead and go home. At least the kit will be bagged to keep it dry. It's a hell of a job to get everything packed as the wind whistles around me, but it is not raining mercifully. With everything on the bike I ride to the car park and shelter under the porch of the reception block. As I sit I feel my tooth. Psychology has its place with pain, now I have time to think I have time to notice. He's a good chap is Bernard. But. This toothache will come and go but I might not be the best company today at times. The giant tee-pee is the party tent and I won't be able to go to bed when I wish. I'm not sure how he'd feel about my all-too-regular night toilet trips either. I think I'm ready for home. The rain starts as my engine starts. The forecast did say it was going to rain and rain a lot. Looking at North Wales I can see it has already and this fresh bout of biblical rain is not going to help with the already extensive flooding I can see. This is bad. There's coppers stood by the river wall looking worried as a vast delta of muddy brown water rushes under a bridge. There are streams across the road as I climb into the hills. Cars burst through roadside ponds creating walls of water I crash into coming the opposite way. Men in yellow waterproofs are trying to clear a fallen tree as a gust blows one poor chap dangerously into the road. This is bad. 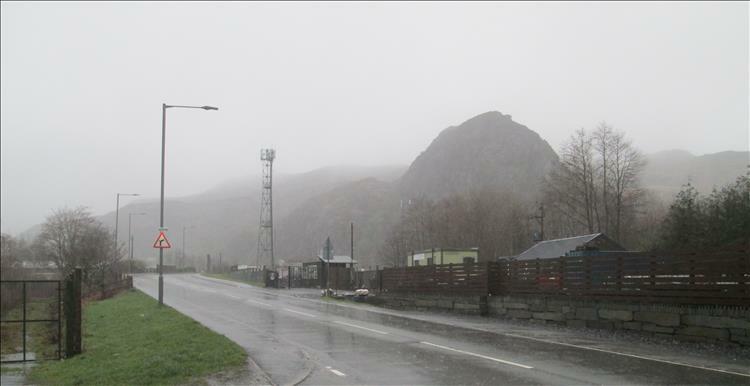 Blaenau Ffestiniog looks like a muddy beach towel in a dirty pond. Betws-y-Coed looks likely to flood (it does later). Blaenau Ffestiniog looking as pretty as can be. I'm reminded of Spain. Eh?! Bear with me. When I saw the beautiful mountains it had a sense of "unreal". I see these things in books and blogs and TV shows. To see them for myself was odd, surreal, I was there, it was actually real. I guess I never expected to see such things for myself. I've seen countless flood reports on TV and through social media and now I am here in the thick of it I once again feel that sense of surreality. I know I'm here I can feel the rain soaking my gloves and yet somehow I expect to cut to an interview with a dishevelled fireman warning us of closed roads then a report on today's dull football results. Then as if by magic everything calms down. As I fall downhill towards the A55 and the northern coastline it turns from a potential disaster area to a regular wet and windy day in North Wales. It is by no means "nice" but this kind of weather is well within my usual experience range. Apart from a 10 minute frantic search of a cafe near Frodsham where I lose my keys by putting them in a random pocket, the rest of the return trip is normal. The rest of the gang survived a long day of heavy rain and continuing strong winds. My bike chain was entirely devoid of lube having been washed off. My kit is still drying as I write. Theres a camping shop on the site according to the wife, Number 5 daughter used to work there and there is a camping and caravaning shop in Barmouth, been in it once or twice. I am more familiar with Barmouth than I ever expected to be as herself's family live there. There surely is a camping shop on site. Whether or not they'd have spare poles for my tent was unknown and at that time the shop was closed. It's all very well and good informing me what shops have what and where but were you available to provide me with this information at 0700 on a Saturday morning!! I come across this a lot when on the road. I *KNOW* there will be a place that sells a suitable pole nearby. There'll be a place that sells a spare lever if you need it, a place that has that particular bolt the bike needs, a place that sells made up cables for a broken clutch cable, a lady who can fix that broken jacket zip, someone who can re-glue the sole of my boot, somewhere to get my glasses fixed, a tyre shop with the right tyre for your bike, a place that sells the bungee to replace the one that's broken and so on and so on and so on and so on. The thing is when you're sat in a tent at 0600 bracing yourself against the tempest it's hard to find out where these places are. When you're stood at the side of a busy road in the tippling rain Google is not much help because mobile phones don't work when they're filled with rainwater. 4 of the daughters and the four sons are inherited. Gordon Bennett Borsuk, with you and Er'Indoors you've got a football team. No wonder you like going for a bike ride. I was there too! I stayed in Penmachno from Friday to Monday. On the Saturday I was out riding in the 50MPH wind and driving rain - I actually struggled to get back because the Police had closed all but one of the main roads south to Betws-Y-Coed from the north. In the car park on the top of Great Orme I was standing leaning 30 degrees into the wind, it was a second gear job riding up the rock becuase of the cross-winds. I had fun riding through some 2 ft deep floods on the back roads. As for camping - pot that for a game of soldiers, I like a warm, dry bed, Wifi and freeview! Dry bed, wifi and freeview?!? Amateur. Lightweight. Wuss. I'm not envious, not at all, no, not at all. There's nothing like sitting on a hard top box at 0600 while holding your tent up in a storm. It's what makes adventurers adventury. Imagine that, being all warm and dry and comfortable and safe and cosy and being able to dry your kit while watching the news reports of the terrible weather. No at all envious. Much. I did years of rallying, the Dragon and the MZ Rider's Club Winter rally were the worst, did all the big MAG rallies and lots of club rallies - can't be bothered with it now. I sometimes think about going wild camping but I wouldn't be able to ride where I want to ride with the bike all loaded up with camping gear. 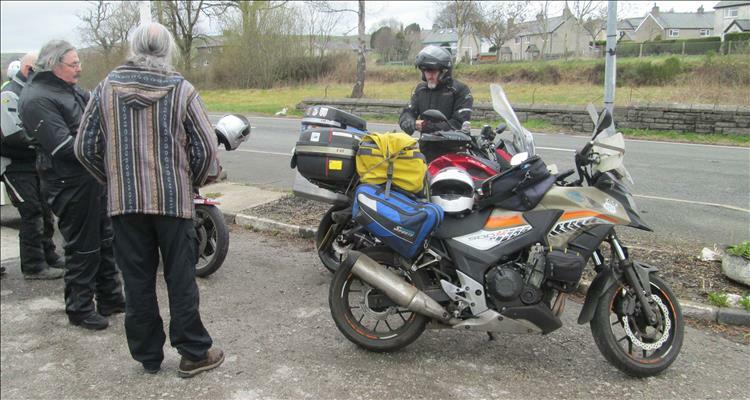 What I'd like is it to be the sort of person who can sleep anywhere, there was a chap turned up to one of our club rallies on and MT500 with a square of tarpaulin - he made a lean-to with his bike and the tarpaulin sheet and slept on the ground in his bike gear! I am totally in awe of that. For myself I need comfort and quiet in order to sleep, I've had enough of clambering out of a wet tent, bleary eyed and wobbly from sleep depravation and thinking "why the hell am I doing this?" I've often stated I am not a natural camper by any means. I envy those who seem to take to it entirely naturally, who sleep just like they're at home, for whom pooping in the woods and wiping with leaves is completely natural. I too like my home comforts, my privacy, my internet access and my own personal loo. I camp for three reasons. Primarily because I'm tight. 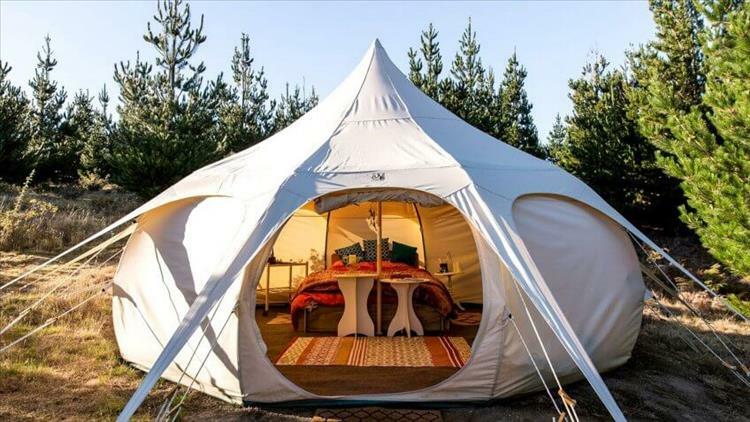 That said it's getting expensive, it seems many sites are heading towards £20 for a night's pitch but I struggle to find BnB these days for less than £50. Secondly because of the flexibility. Save for peak holiday season weekends I can generally turn up at most campsites and expect to get a pitch. This means I can go as far or not as far as I wish. It allows my trips to be flexible. Thirdly because I, weirdly, strangely, oddly, find some peculiar pleasure in the challenge. I am quite literally stepping out of my comfort zone. While the act of camping is not thoroughly pleasurable for me I do get a sense of achievement and satisfaction from it. I have a full and complete understanding for those that don't want to camp, believe me. As for those people that turn up with a tarp. Hell yeah I wish I was that wild, free and adventurous! Thing is, even the most rough n ready n wild type, after several nights of cold wet misery under a tarp has got to wear thing sooner or later. You have to rough it occasionally, I quite agree Ed, keeps you in touch with your common man. Is that your version of roughing it Upt? I've done enough roughing it my time - including walking the Pennine Way when I was a youth, with only an ex-army groundsheet to lash against dry stone walls which I shared with all sorts of noxious wildlife. There's an interesting(?) graph to be drawn which has minimal wild camping at one end - cheap, flexible, cold, wet, inconvenient - and 5 star hotels at the other - comfortable, rigid, convenient (sometimes), expensive etc. Finding the sweet spot (which differs for everyone as all those parameters are subjective) is the trick. For many years we were dedicated campers - first on the bike, later by car. We loved the ability to go where we wanted and have the choice of preparing our own food or enjoying hat cuisine on occasion. I had enough of hotels when I had to use them extensively when I was working (and as my employers were paying, 5 stars they definitely weren't). So now it's the Discovery tugging a caravan, which for us has the best combination of comfort, flexibility, low(ish) cost. I suspect that after some years this may be replaced by a motorhome with room for a 125 on the back as the big drawback of the car/caravan is the lack of powered 2 wheels (although I have a cunning plan involving batteries and hub motors for our pushbikes). Sharon and I are currently working on our own very very very low key version of the camper and motorcycle "thing". IT's a while off yet but details will be forthcoming if my cunning a devious plan comes together. 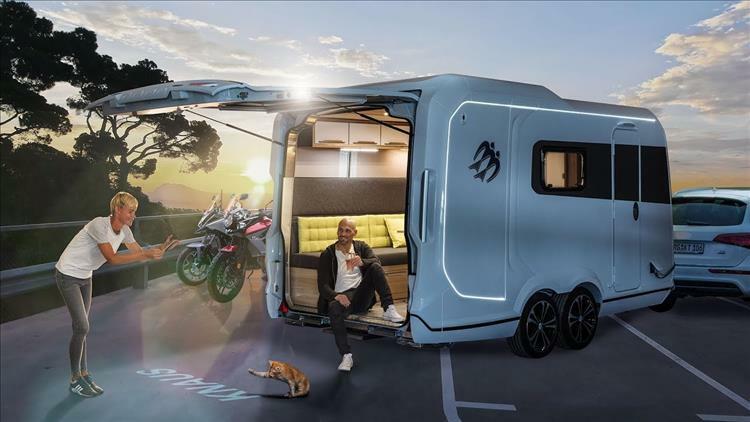 I have seen people make a door in the back of a caravan and use it to transport trials bikes (and for sleeping) but have no photos. Just get an ordinary van. Mine was £700 and works a treat, it's very useful to have a van anyway for transporting house related stuff. We recently replaced our oven, fridge and washing machine - no need to wait in for home delivery, just drive down to Currys and pick them up! 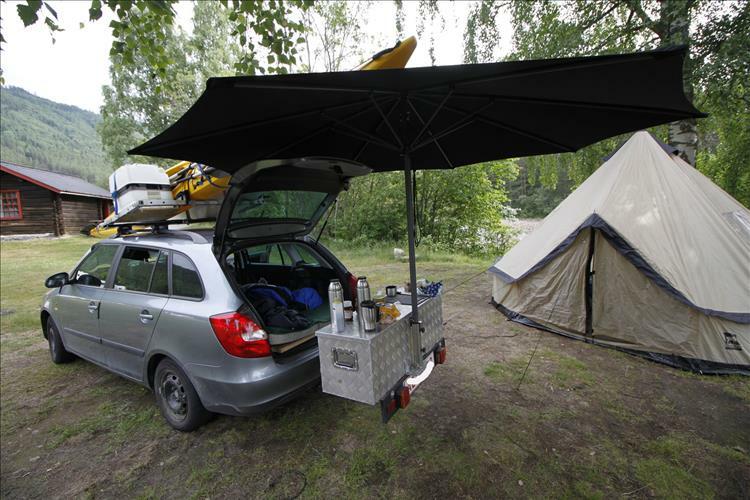 A van (as opposed to a campervan or caravan) also allows you to stealth-camp. I research (google maps and street view) for three locations when I'm planning on going to a particular area. 1) Day spot - typically a layby on a busy A road, leave the van here all day. 2) Evening spot - preferably somewhere on the seafront (if at the coast) or with a nice view of the hills (if inland), here is where I chill out for the evening. The van doors will typically be open, the bike might be parked next to the van. I spend the evening relaxing, watching a movie and eating supper. 3) Night spot - having attracted attention at the evening spot it's time to move on (most attractive locations have "no overnight parking" signs up anyway). 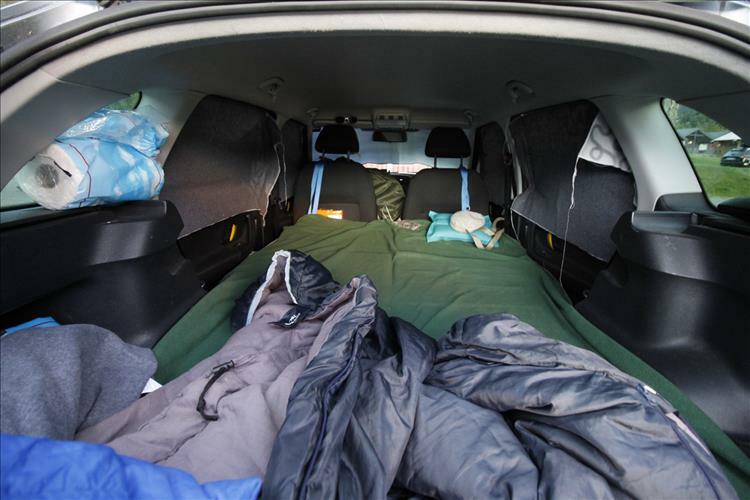 Put the bike in the back of the van, hang the blackout curtains over the rear windows and behind the seats (my van has no bulkhead) and prepare the camp bed. Then drive to the night spot, park, climb into the back and lock the doors. The idea is just to look like a van parked up and to not attract attention. There is nothing illegal about sleeping in a van on an industrial estate but it's good to avoid unwanted attention. Obviously you want to avoid alcohol if you're doing this, there is always the chance you'll need to move on. I've got a strip of carpet in the back which runs down the left side, the bike is on the right side, there's a camp bead and inflatable arm chair (marvelous thing). Let's talk about the unmentionable - I have a bucket, a roll of bin liners (I always use two layers to make sure), a toilet roll and a box of nitrile disposable gloves. The disposable gloves are I think a stroke of genious. The problem is that I have no running water or sink or soap, so the gloves negate the need to wash my hands after using "the bucket". 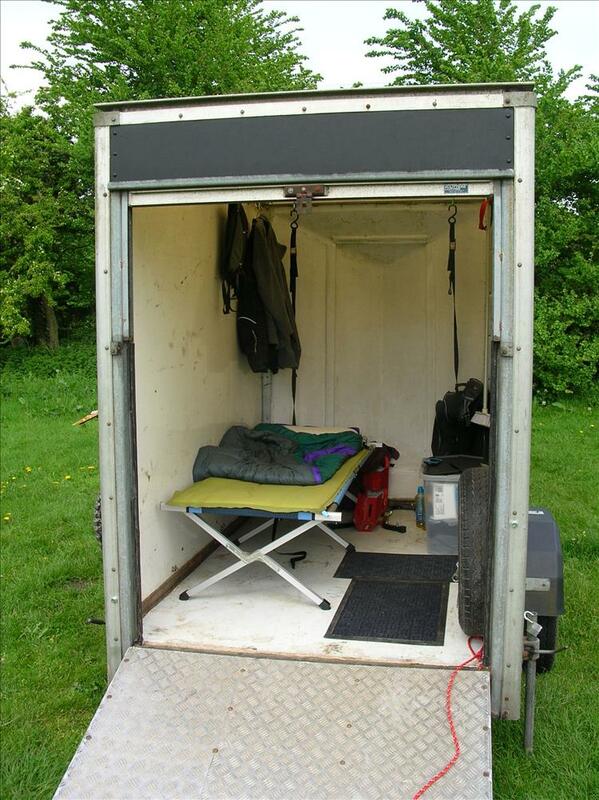 Camping/bike transport trailer, advantages no road tax or MOT costs, negligible effect on car fuel consumption. Translucent roof gives plenty of light without windows. That set-up looks like the back of my van pretty much, except mine is half-carpeted. Would you leave your car with this attached to it parked in a layby or on an industrial estate? For me the van is a useful second car aswell, so I can justify it on that basis too. What are the dimensions of that trailer Bill? Would it take 2 big fat motorcycles? Yes Bob I used a strong bike lock chain to fasten the trailer A frame to the car as well as a hitch lock and trailer wheel lock. No bike sticker to advertise contents and no windows I did have van for a while but found it hard to justify the second vehicle cost in a one driver household.